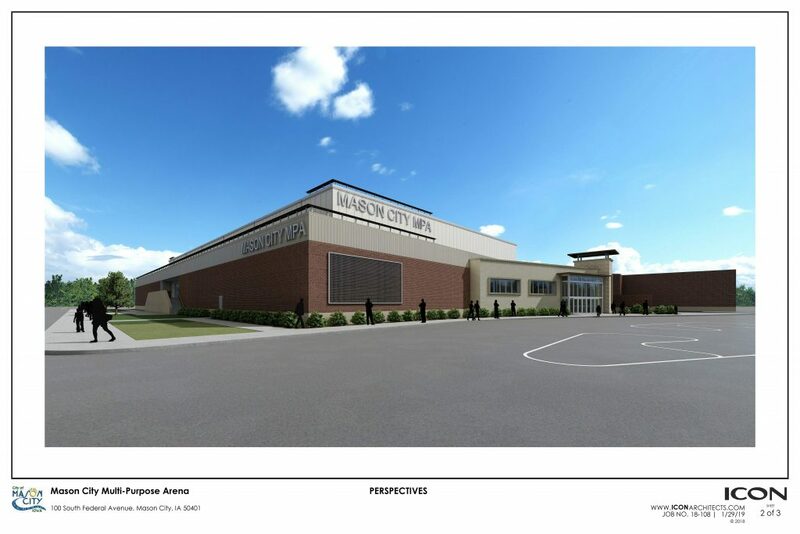 MASON CITY – A groundbreaking ceremony was held in Mason City Monday for the multi-purpose arena project. Artist renderings were unveiled as part of the ceremony, which took place at noon at the former JC Penney location in Southbridge Mall. Construction has already began on the arena, with demolition going first. Ice events and activities will dominate the use of the arena, and no one knows the cost nor the time involved in transitioning the arena from ice use to accommodate other events, like a concert. 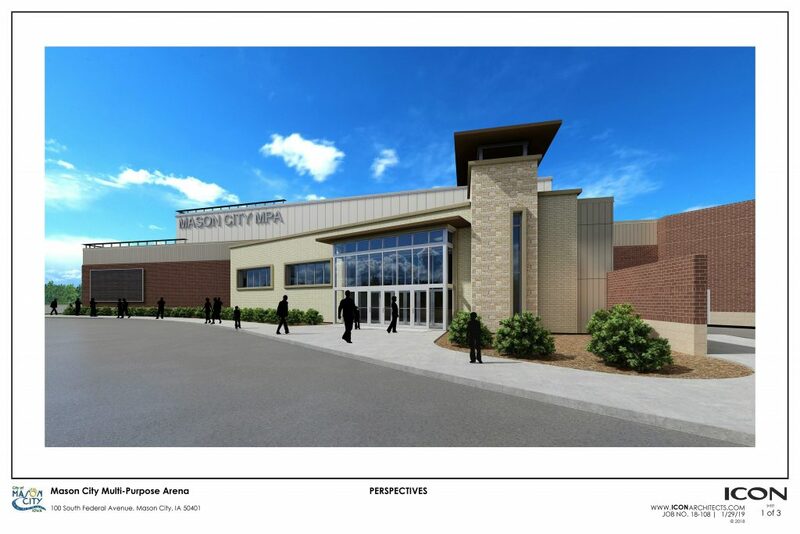 Mason City residents are familiar with artist renderings in connection to the Renaissance Project, which the arena is a key component of. 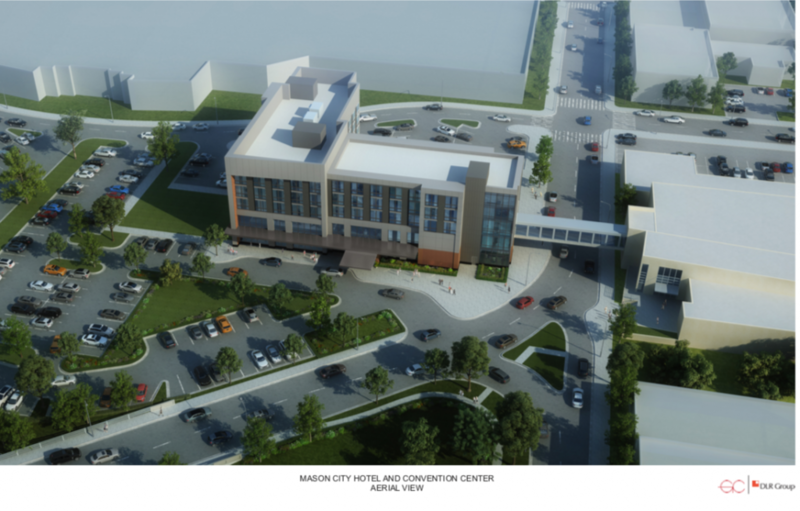 Beginning in 2013, renderings of a proposed downtown hotel were leaked to the public. The hotel morphed into the Renaissance Project, with supposedly 5 key pieces: Arena, hotel, skywalk, museum and pavilion. It could cost nearly $40 million to build in its entirety, if the project actually goes fully forward. Today, artist renderings of the arena and the latest rendition of the hotel were leaked. Mayor Bill Schickel claims numerous construction jobs and at least 100 permanent jobs will be created as a result either this project or the entire Renaissance Project. You can watch his statement made Monday morning, below, also. Hey Mayor when will you release any info about the 200 jobs that you keep bragging about. You say the first 100 jobs during the construction phase and then 100 permanent jobs when construction is finished. Where can I get the applications? Can someone please indicate how much money the Hockey Association actually has raised to date? My family is willing to set aside a few bucks to donate but need to determine if this is even feasible or will there be fund raisers for the next decade. If you think this is a well-planned project you must be The Mayor or one of the Cronies involved. They had to build this now, or the MCYH was going to pull out of this deal. I hope they pull out before they stay in too long and pro-create another outfit like themselves that need welfare from the taxpayers just to exist. MCYH has put zero cards on the table, no release of their last five years books, no proof of payment investment…nothing! 1060 people showed up to vote on this project and 600 voted yes. The figure in the crooks and the dirty officials into the equation Calculates to 100 cons dividing $40,000,000 that Mason City residents will be paying back for the next 40 vears. This money could and should be spent on bettering our community. Big, big, big fallacy in your argument. You’re suggesting the $40M somehow be used for something else in this community. Think real, real hard about that statement and see if you can figure out what’s wrong with the basic premise of your argument. I’ll give you a hint…Look at the sources of funding in the $40M and think about if they’re available to use on something else…. So why did the people that opposed this not vote? Should hVe been a landslide of no votes correct? So-called “respected” persons in elected office and un-elected positions of influence lied to the public, placed illegal signage, used city resources, etc. The zombies who showed up to vote lapped it up like thirsty dogs on a hot August morn due to sheer desperation. So many were turned off and stayed home out of disgust as they readied plans with UHaul to get packed up. This whole deal has been a major joke since October of 2013 when Eric and that band of conivers trotted it out in the Globe and KIMT, along with their laughable pay cut and other red herrings to fool the zombies. Instead everyone in favor of this debacle showed up to vote yes but the majority of the citizens that do not want this did not take the time to vote no!! Has it occurred to you that just possibly, more people than not are in support of this project? Not everyone in this town is dirt poor, high school educated and minimally employed. A lot of us are fed up with the continued downward spiral in this community. We’ve long watched a culture of ‘no’ in this community when it comes to development and that attitude has got this town nowhere. The Prestage development fiasco has awoken a sleeping giant. It’s time to invest in this town and make it grow again and not let a small group of very vocal curmudgeons continue to set city policy. I really have to wonder who counted the ballots or if they were even legit. I would not be shocked in the slightest if the elections in Mason City have been thrown for years. There is no way the public can be as dumb as they seem to be… or maybe they are. I have thought this and brought this issue up many times. Are the balloting and counting as corrupt as the council itself? The Mayor promises 100 permanent jobs paying $9,000,000 in earnings. So do we go to the City Hall to get the applications for the 100 jobs paying $90,000 each? What are the job titles? Whats the benefit package look like? Who exactly is handling the hiring process? Will there be any education or qualifications necessary? The more information about these 100 careers the better. Great questions. All we have seen for years from the mayors office is empty statements, renderings of buildings and skywalks and parking ramps that never get built, and many many invoices, bills and expenditures on the Renaissance Project. Now they think they have accomplished something since a few carpetbaggers stuck some golden shovels in some dirt. Let’s see how this pans out. Sometimes forging ahead into darkness is OK but other times it leads to disaster. What will the outcome be here … Southbridge II? Northbridge II? Where’s the hotel? Where is the final deal on the hotel so they can get the financing? Without the hotel they lose millions of dollars. I can’t believe the started this fiasco without finalizing the deal. What a bunch of dumb asses/. ….those other elements do not matter. ONLY the arena matters. 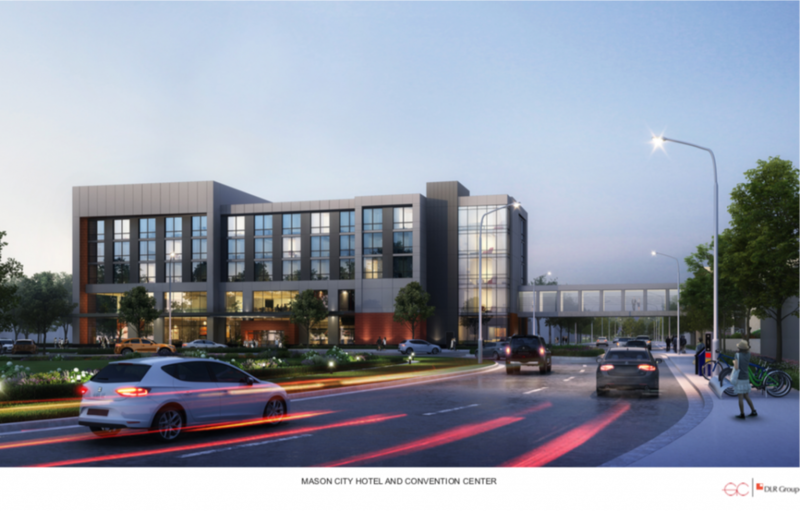 They sold us the total development package, skywalk, museum, hotel and so much more, then it came down to what it was all about…MCHockey and a pretty new arena. Open your wallets MC. In the Ariel view it shows grass and tree’s to the west and south of the Midas garage eliminating the main entrance and the four bays. In the black and white drawings it shows a flight of stairs leading up to a cat walk that appears to have no seating or any purpose. The mayor claiming the project is going to bring one hundred permanent jobs. What are the jobs? How much does it cost currently to heat and cool the mall and the Museum? How is any of this possible? Every detail of the entire plan should be posted for the people of Maso City to read since we are the one’s paying for it. Those are details Bill doesn’t know nor understand. But Jesus will see he gets a paycheck. You forgot to mention how THEY shoved this mess down our throats without any public ideas or input, or that nobody will benefit from this except for MCYH and they have NOT come up with the $2 million they promised, or that we have NO agreement with the hotel or state funds, or that it was sold as no tax money needed but that has changed and it WILL cost the taxpayer plenty! They shoved it down your throat without any public input??? Are you high or stupid? The project was voted on by the public and was OVERWHELMINGLY supported by the public! The truth is that the lazy, complacent, yahoos, who did not bother to vote allowed this to happen !! In fact, only 6% of registered voters showed up at the polls. So, only 1060 people voted and the majority voted yes. I am well aware that the truth goes way over most of the people here , but this happened. When people say ” My vote doesn’t matter “. well, dont make that mistake again.. The taxes we will pay will be staggering. Did you see the people with the golden shovels? Wow. How many of the golden shovel gang actually live in Mason City? He’s right! They never asked the public for ideas for the failed mall…other sports, concerts, bowling alley, movie theatre, smash park, etc. From the beginning it was Hockey, Hockey, Hockey! And the vote was a joke with barely 1000 people voting, hardly a mandate. You do’t get to voice your opinion in on the mall because the city doesn’t own it. Its private investment. Just like the city doesn’t tell you how to furnish your house, the city can’t tell an private investor what to do with their property. From the very start, this was about building a multi-purpose arena which had been an amenity the residents indicated they have wanted for a very long time. Like any other property, multi purpose arena’s aren’t free. They have to be paid for. So, its outstanding the city identified an rent paying organization (MCYH) to fill the calendar for over half the year – That has taken a substantial amount of risk out of the project. Why do we need two multi purpose arenas? Where is the other? Do you mean the 50 -year old pole barn at the fairgrounds?? Exactly! We’re spending many millions of dollars on a building we DO NOT own. Thank you very much! It’s the only way the financing works!!!! Multi purpose arenas aren’t free, they must be paid for. Part of the financing is TIF dollars. Municipalities don’t pay property tax, so if the city owned it, there are no TIF dollars to pay for its construction. That has taken a substantial amount of risk out of the project. They have done NOTHING to sustain any risk idiot. They get to name it. They get to sell sponsorships and control sponsorships. They get credit for old broken down equipment. But have yet to show us the money. YES people like you are this dumb. 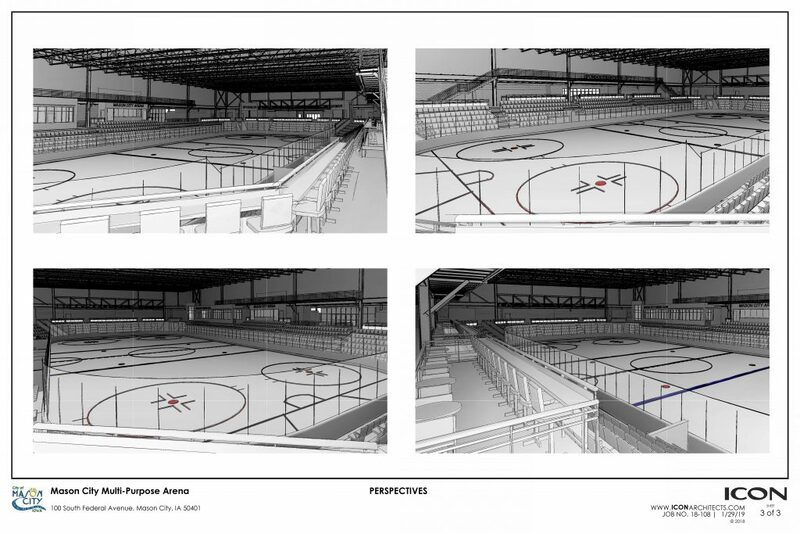 the TOTAL PACKAGE was voted yes, NOT just a fragment which is this MC Hockey arena. THIS IS CALLED A BAIT AND SWITCH. I voted yes, wish I had not. This was and is a disaster. A huge shout out to the Globe Gazette for promoting this fantastic opportunity. Thanks to the great former mayor Eric Bookmeyer and outstanding past council members for their great vision of the future of Mason City. And now the first-rate backing by the tremendous current mayor, Bill Schickel and the current council members. And what more can you say about the MCYH organization for their awesome work on this project. and Mason City Foundation’s president, Dalena Barz. And all of the rallying by Loni Dirksen. 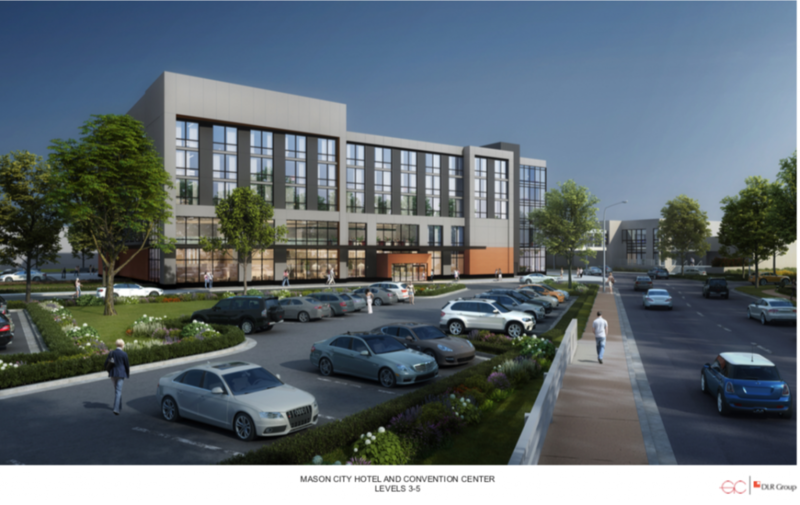 The future will be much brighter for Mason City now!!! You need to be anonymous to make this statement? Rings hollow. Did your mommy cut your balls off in the delivery room?